A few weeks ago I had the pleasure of photographing these two cars, with an awesome background story. What you see here is two Camaros owned by the same person. 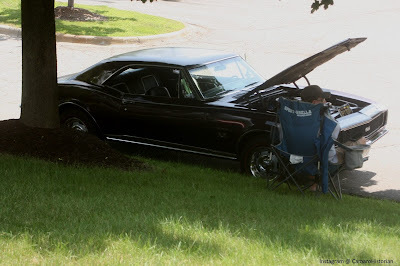 In 2008 Matthew and his father embarked on the endeavor of restoring this 1968 Camaro when Matthew was 16. What you see is a 68 Camaro in Fathom blue with Medium blue interior, a combination that makes it a pretty rare sight. On November 20th, 1967, this 68 Camaro made its way down the line getting sprayed in blue and having a 327 installed. Matthew and his father made their best effort to return it to the glory it once was, and in person I can tell you, they did a fantastic job. This part of the story is standard issue for father son projects around the country. The story, however, does not stop there! Matthew began pursuing an engineering degree in hopes of one day working for General Motors, and for him, the dream came true. Matthew was even fortunate enough to land a job within calibration for the 2.0-liter turbo Camaro. Dream job, favorite car, it doesn’t get much better! Matthew finally opted to purchase a new 6th gen Camaro, but this is where the story takes an even better turn. Through good detective work he was able to obtain that build date of 11/20/67 for his restoration project, and this gave him an idea. Matthew contacted the plant manager and several emails and phone calls later, Matthew got his wish. He was able to convince them to build his new Camaro on 11/20/2017, which is exactly 50 years to the day of when he 68 Camaro was built. Matthew now has two awesome Camaros that are 50 years apart! He was even present to witness it get built, something that does not happen often...ever really. I hope Matthew enjoys both of his Camaros, and continues to share his unique story with other Camaros fans!